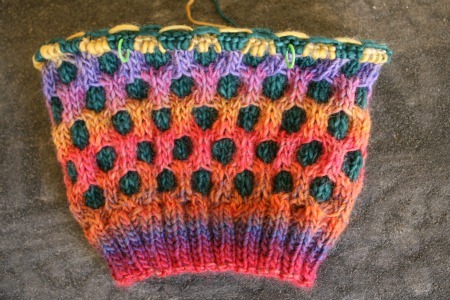 I did finish this Meshed Hat quicker than the others but that’s because the changing colors kept me entertained. Me at 9:36 pm : Oh! Now its turning pink. I can keep going to see how that looks. Me at 10:17 pm: That orange against the dark green is really popping. I don’t need to go to bed yet. Me at 11:05 pm: I think there is some purple comin- *yawn* coming up. I can do it. Just need more coffee. Yes, I really am that simple minded. Buts sometimes simple minded is good! Sometimes it gets you a hat. 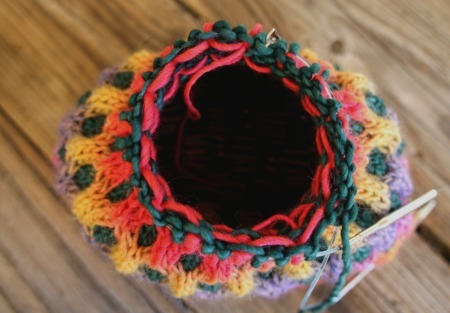 If you had this gorgeous lump of color of your needles you’d keep going too, right? Did you know that when you get to the decreases at the top, it can kind of, sort of, stand up on its own? You would probably think of those things if you were knitting on 3 hours of sleep. And when it was dry I got to wear it for an afternoon! Now its on its way to The Sated Sheep to live out its life as a store sample. But that’s okay because I have two more Meshed Hats that I’m keeping all for me! If I convinced you that you need to make one of these hats for yourself, which of course was the whole point of the knit-a-long, you can find the pattern here on ravelry. I used Gina in color 0009 and Malabrigo worsted in verde adriana for this version but any two colors in worsted weight will do. 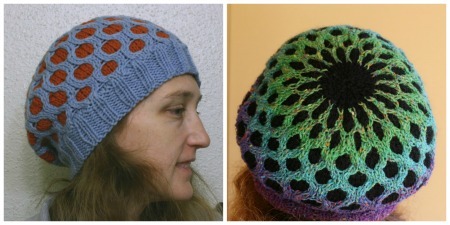 You’ll also need needles in size 6 (for the brim) and size 8 (for the body) and a cable needle. Have fun knitting your new hat. And try not to stay up too late while you do. Lack of sleep can make you weird. 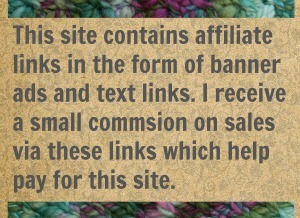 Stranded Knitting Colorwork – a free tutorial → ← Since You are Giving Stuff for Christmas… LABEL IT! 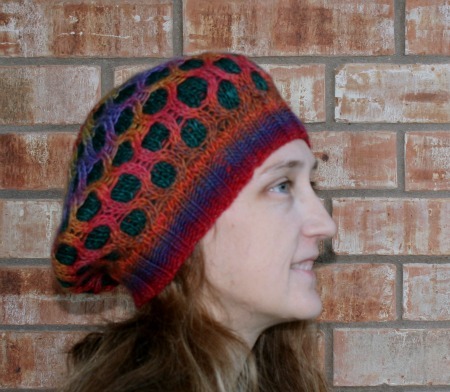 12 Comments on "Meshed Hat Knit-A-Long Part 3 (and done!)" She just flies, doesn’t she? lol. Its just that I have nothing else to do you see. 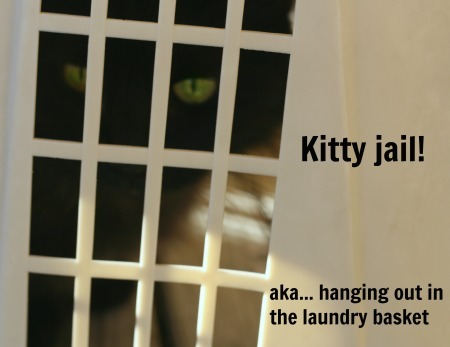 I knit, teach, and play hand maiden to two very back cats! Btw, nice job. Liked your colors. What beautiful work. So gorgeous!!! I absolutely LOVE the colors of this hat. 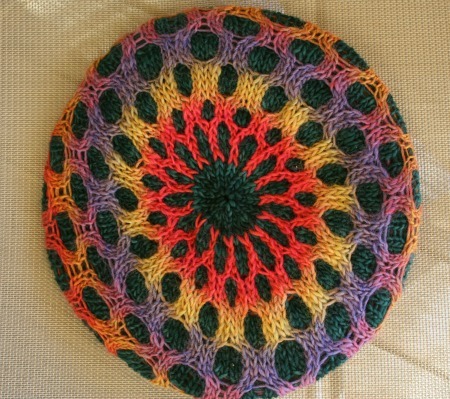 Beautiful work…awesome pattern! OOO that is super cute!!! Great colour choice, too! Thanks bunnymuff! Coming from you that is a real compliment!